In an effort to make me feel better as my brain esplodes with all the crazy* going in my life right now, famed philanthropist ElleC sent me a care-package. 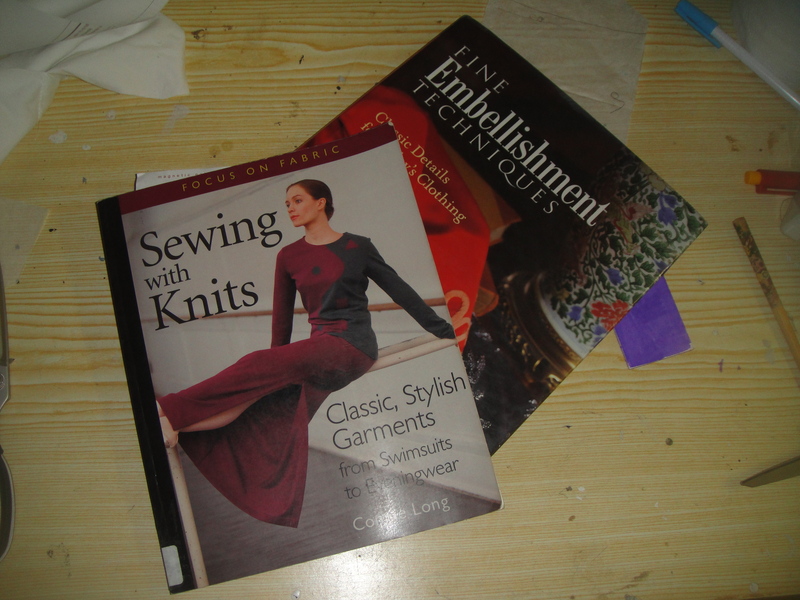 Two books on nifty sewing techniques. Because something else to read is exactly what I need right now. Not to mention inspiration about time-consuming hand-decorating techniques I HAVE NO TIME FOR. Also, Canada Post managed to deliver these in like, two days? Which is insanely impressive for them. I mean, ElleC and I aren’t located too far apart, as the crow flies, but there’s still like mountains in the way and stuff. Thank you, Canada Post. *I.e. trying to finish a PhD thesis, juggle various family medical issues (not mine), and preparing to move back to our hometown at the end of the summer with neither savings nor promising career prospects, all without having a total nervous breakdown. Apparently you aren’t aware that books do not have a sell by date, like eggs and milk do. You can read them anytime, even years from now. What did they teach you in school anyway? You mentioned once, your envy of my large sewing library, so being the kind, generous person I am known to be, I was thinking only of you and trying to assist you in acquiring a sewing library as vast as mine. All I get for it is sh!t and abuse. Humpf. You are most welcome. 8-D.
Sweet! Nice, ElleC. 🙂 We’re all rooting for you, Tanitis. Well, at least they are a pleasant distraction when you have a spare 30 seconds. It sounds unlikely that we can help, but I’m sure you know that you only need to ask and your bloggy friends will lend a hand! have you considered investing in a time machine? Perhaps starting a cult? from what I hear, they can be quite lucrative and as a self-employed person you’d get to create your own prospects. Yeah, balancing work and relaxation is the trick… not one I’m very good at, I fear. Well, it sounds like you won’t have to be bored during summer. :O In between all those busy things I can imagine it sometimes can be wonderful to just lock yourself in a room and cocoon for a minute or so, with a sewing book. It can be just the thing you need te reload. It works for me, in hectic times. Hopefully they will provide the necessary distraction when you have a momentary well-deserved break. I presume the next fantasy sewing item will be an embellished knit ying-yang one?! saaweet gift, and holy stress inducing footnote batman! pouring you a cocktail. Wow. That’s a full plate. My fingers are crossed for you with everything you have going on! Don’t forget to take a little time to care for yourself! BTW – The Sewing with Knits book is a good one! Ooooh books. Bugger about the mad schedule and I hope the medicated ones return to wellness forthwith. I’d offer to write the thesis for you, though I guess Canada Post would be the least of your worries then hey? Of course, Alberta *would* just give you all the nice weather right as you’re preparing to leave it, right? That list of balls you’re juggling sounds mighty tricky…my thoughts are with you!